The Catalina 30 deck curves gracefully to form a very functional and spacious boarding platform. Low maintenance materials have been used extensively. The galley has enlarged counter space, with more and larger cupboards and drawers. Varnished teak cabin surfaces are accented by polished brass light fixtures. 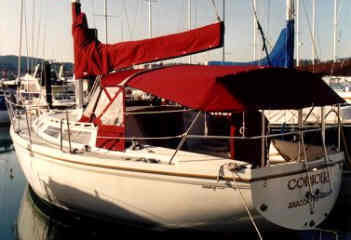 The Catalina 30 has two private double cabins, one forward and one aft. The forward cabin is a V-berth formation. The salon settee converts to form two more berths on the starboard side and a single on port, if necessary. As there is only one head with hot and cold shower, we ideally recommend four people for a comfortable charter. The Catalina has classic slab and roller reefing, one wheel steering, VHS, GPS and electric anchor winch. There is a bimini and dodger, an ondeck shower and BBQ, a tender, AM/FM radio & CD player, fully equipped galley with LPG stove & oven, fridge/freezer, pre-charter cruising guides, full boat and chart briefing.